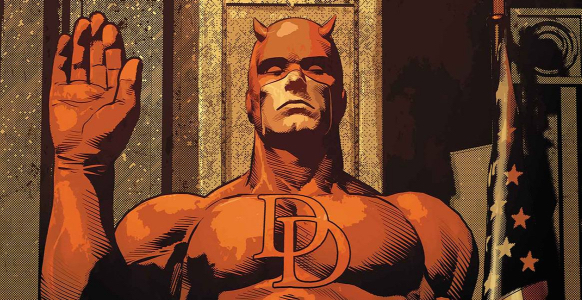 Today, Ryan D. and Michael are discussing Daredevil 15, originally released January 11th, 2017. As always, this article contains SPOILERS. Today, Spencer and Drew are discussing Secret Origins 6, originally released October 22, 2014. Today, Shelby and Drew are discussing Wonder Woman 32, originally released June 18th, 2014. Shelby: Often times for me, the hardest part about writing any of these posts is this very intro. I always want to find some overarching theme in the issue, or one relevant anecdote from my past to broadly introduce the issue. I used to write the intro last on a regular basis, so I could find that one theme as I was writing. I couldn’t possibly use that approach with this post, however. Brian Azzarello has given me so many individual moments to get excited about this issue, the best I can do at coming up with a unifying theme is to marvel at how beautifully the pieces fit together to create the whole. Today, Scott and Drew are discussing Wonder Woman 31, originally released May 21st, 2014. Scott: Zola issues this reassurance to the Amazons, whose world is about to be turned upside down by the arrival of men on Paradise Island. It’s interesting that Zola feels this way; most of the trouble in her life has been caused by men. She was impregnated by Zeus (who’s still missing, by the way), held captive by Hades, and had her baby nearly killed by Apollo. She could easily have turned against men, but she’s wise enough to realize these are anomalies, and far more men have helped her along the way. Men, like many other groups, often get a bad rap because of the actions of a select few. As Wonder Woman 31 shows, sometimes those actions are unspeakably horrific, but prejudice will do nothing to overcome them. The good, both men and women, must unite to defeat the evil. Today, Taylor and Drew are discussing Wonder Woman 30, originally released April 16th, 2014. Taylor: The internet is an amazing tool. The rhetorical nature of that comment is almost so great that it’s remarkable, but I think it’s occasionally a good exercise to step back and take stock of the amazing things that make up our world. In the recent past the internet has caused real social change given its ability to unite people behind a singular cause. In particular, the movement for gender equality seems to be gaining more and more steam, as both women and men are able to voice their experiences with prejudice in their daily lives. Comics, being a reflection of the world of which gave them birth, are also picking up on this trend. It seems only natural that Wonder Woman, a title which features an empowered female lead, would eventually weigh in on this subject. However, the subtlety and grace with which it broaches this topic in issue 30 is both unexpected and wonderfully wrought, making for an memorably understated episode. By Cupid’s pistols, it’s Valentine’s Day! 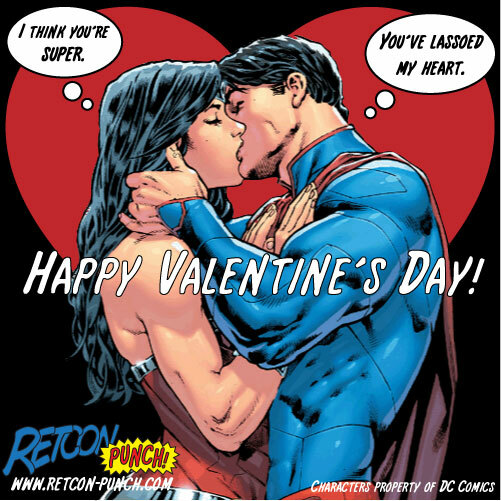 For Valentine’s Day last year, you may recall, we here at Retcon Punch showed you our love with corny, superhero valentines. Obviously, we had to do it again. So, Internet, this is our way of saying Be Mine; please enjoy these free, awesome valentines! Print them, share them, just keep our name on them; more after the break! Today, Patrick and Drew are discussing Wonder Woman 26, originally released December 18th, 2013.